Spanish Name: This piece is marked Rosal, Made in Spain. Our seller indicates that the brand "Rosal" was founded by Lladro in 1967 as the second brand, then it was called "Zaphir" and finally it was rename "NAO." 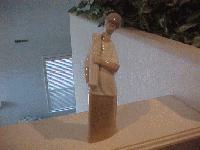 This figurine has gold Lladro decal on front right leg.